I made an eye doctor appointment for tonight after work. It’s been about a year and a half since my last one, and recently my eyes have been feeling, how should I say it, like they are burning out of my skull. I’m using moisturizing eye drops two or three times a day, and my eyes still end up blood shot and burn-y at the end of the day. Now, admittedly I haven’t been wearing my glasses consistently, and I did spend a good chunk of the last week ugly-crying all over the place, but I’m thinking it has less to do with those factors and more to do with my current prescription. My eye doctor said my eyes could adjust to this prescription after a while. I realized while looking back through my blog archives that I’ve had my glasses (the Huxley style from Warby Parker) since September of 2011! What?! And then I went all Gary Oldman and got the same style in clear frames. Obviously. Depending on the results of tonight’s appointment, I might be ordering a new shape frame. The Sims (above) look great, but I know what you’re thinking: they’re virtually indistinguishable from the Huxleys. Except they’re thinner and less aggressively hipster-y. I don’t need new glasses, I could easily send my current frames back to Warby Parker and have them update the lenses if my prescription changes, but where is the fun in that? I’m putting it to a vote. Sims: yea or nay? Yeay obvs. Cos then we get to see new photos of you wearing them. Possibly the most illiterate comment I’ve ever written. I’m so tired. Well, I hear what Sue and Emma D are saying, BUT. I just like the new frames better. They’re lighter somehow, and I like that. I like the hint of tortoise along the bottom and the cleaner line. I love your old glasses on you, so if you’re saving for Paris, I’m sure that’ll be fine too. 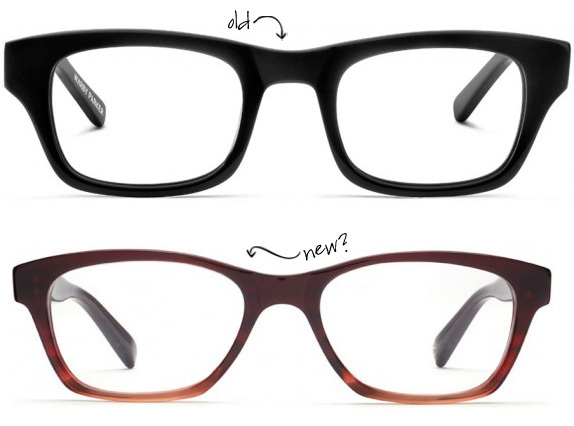 I love the new – and tortoiseshell is so flattering. I’m looking for new specs too! Oooh tough call, but the Huxleys are so classic that I’d probably stick with them! I do love anything tortoiseshell, so I’m afraid I have to enable and give my thumbs up. Though, Sue might have a point. ;) I’m sad that eyeglasses have become hipster-ish, along with buns. What’s a girl to do if one is a necessity and the other a part of her identity for 25 years? Anyway, there’s no way you have an ugly-cry. You don’t ugly-cry. I envy your cry face. either pair would be lovely on you! I love the sims frames! I’m more attracted to brown and less harsh frames anyway. Anything too close to black and I feel they are too stark on my face. Also – this is the first time in seeing your clear huxleys, I love them! I almost bought a pair similar for my wedding glasses but was afraid I’d regret it. I kind of regret not getting them just for fun because they look so lovely on you and reminds me that I did like them! The Woody Allens all the way! Chunky frames FTW. Yay! a change is as good as a rest as the saying goes.